I have never been one who likes to pick favourites, but in my heart of hearts I know spring is the season I love best. Especially the month of May, when everything looks and smells so earthy, fresh and green. The month even tastes that way – it is the month of asparagus, after all. 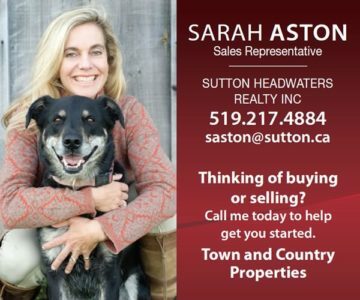 Although our local climate is not suited to growing limes, Sexton’s point is a good one. 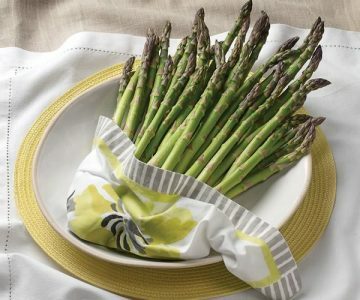 After a long winter of barren fields and gardens, the rich flavour of asparagus is truly a springtime delight. Jeff and Sharon Wilson own Birkbank Farms near Erin, the only major commercial asparagus farm in the Headwaters region. Jeff says asparagus “is not a hard crop to grow, but it’s not easy to grow well.” And because it grows so quickly, it is very labour-intensive. 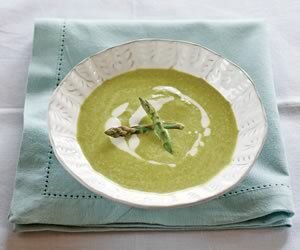 Curried Asparagus Soup. Photo by Pete Paterson. A member of the lily family related to onions, leeks and garlic, asparagus is a perennial crop that will produce for over 20 years, if it’s well cared for. Neil Morris, who has been growing asparagus for years on his property in Inglewood, tells me the most important part of sustaining asparagus production year after year is to “think below the ground.” In other words, focus on the health of the root system. 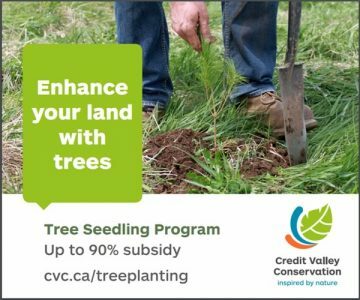 This means liberally fertilizing with compost, manure and bone meal, applying mulch to suppress weed competition and manage moisture, and resisting the urge to overharvest. After approximately six weeks of harvesting, Neil leaves the asparagus spears to grow into soft, flowing (and rather majestic) ferns with bright red berries that birds love. For the remainder of the summer, the ferns soak up the rays and replenish the nutrient and carbohydrate levels in the roots. To grow your own asparagus, start with asparagus crowns (the base and roots of one-year-old plants), which are available at garden centres in the spring. Plant them in late April or early May, up to a month before the last expected frost date. Asparagus performs best in full sun, in well-drained, well-fertilized soil. Keep in mind asparagus ferns can grow up to six feet tall, potentially providing unwanted shade to adjacent plants, so locate them accordingly. Begin by digging trenches approximately one foot deep and one-and-a-half feet wide. Place the crowns one by one into the trench about a foot apart, and mound up the soil from underneath so the plant base is slightly above the roots, and the roots are fully spread along the trench. Cover the plants with only two to three inches of soil. Over the next few weeks, water well and continue covering the plants with soil until the trench is filled. Soon enough, bright green asparagus shoots will begin poking through. Now comes the hard part. All sources agree you must not harvest any asparagus spears the first year after planting. In fact, some sources say you should not harvest any in the second year, either. A few even say to take it easy in the third year as well. This heroic display of willpower gives the root systems a chance to establish themselves, and greatly improves the quality and longevity of your crop. 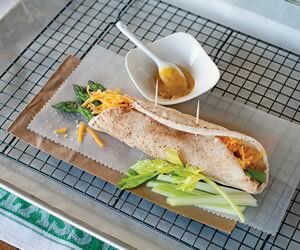 Honour this “first taste of spring” by making a delicious asparagus hotdog. Photo by Pete Paterson. When it is first picked, asparagus has a sweet taste. However, that decreases soon after harvest as the sugars convert to starches. So for optimal flavour, eat your asparagus as fresh as possible. 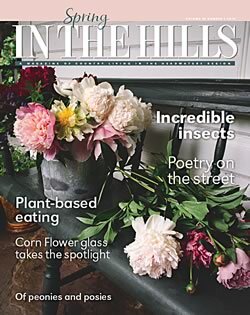 I hope during this year’s asparagus season you find a way to honour this “first taste of spring.” It could be by planting your first-ever asparagus crop, freezing asparagus nibs for months to come, making a delicious asparagus hotdog, or just sitting in the spring sun and watching your asparagus grow. Freezing is one way to enjoy local asparagus well beyond its all-too-short growing season. Most sources recommend blanching prior to freezing, but I have always found it makes the asparagus mushy. 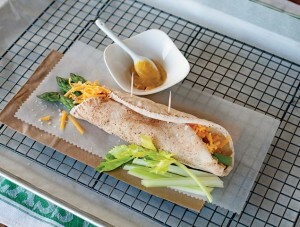 Neil Morris, gardener and cook extraordinaire, swears by this method: Simply cut asparagus spears into one-inch lengths. Spread them out on a tray and place in the freezer. Once frozen, put the pieces in freezer bags and use them all year round in soups, stir-fries, omelettes and more. 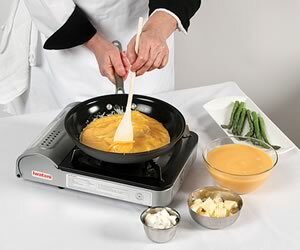 Steaming: Place in a covered steamer over boiling water for 4–8 minutes. Stir frying: Cut into 1-inch pieces and sauté in hot oil in a wok or frying pan for 5–7 minutes. Simmering: Add enough water to saucepan to just cover asparagus, plus 1 tsp salt. Bring to a boil, reduce heat and simmer until tender-crisp, 2–4 minutes, depending on thickness. Oven roasting: Drizzle with oil and salt and roast at 450ºF for 8–10 minutes. Grilling: Brush with oil and place directly over a medium grill for 8–10 minutes, turning once halfway through cooking.